65 iwi are to be offered the chance to take shares in state owned enterprises. The stakes will be available to tribes that have not yet settled their Treaty claims. The Government says the scheme allows iwi more flexibility about how their settlement money is invested. They would be able to get the shares up front - ahead of their final Treaty resolution with the Crown. This is misleading. Iwi, minus a handful of iwi leaders, are not asking for market shares at market prices. Most iwi are asking for 1) the recognition of their water rights and 2) compensation for the use and breach of those rights. Market shares address neither point. Shares-plus, an idea the government rejected, represented an adequate remedy on the second point. However, any move on the second point is largely pointless when the first point is left moot. Shares-on-credit are an attempt to co-opt pre-settlement iwi and mitigate the government’s legal risk. From a political perspective, the iwi leaders who support the offer are salivating too early. The overton window keeps shifting. Rewind one year, preferential shares (which are really what shares on credit are) were considered unacceptable, or radical on the overton spectrum. Today, the offer is acceptable on the spectrum. Fast forward six months, say post a court win for the NZMC, shares-plus might be considered sensible on the spectrum – a compromise in exchange for Maori allowing the sales to go ahead. With this in mind, iwi would do well to wait before jumping at the government's half-baked offer. In any event, the most important thing is that the pre-settlement iwi do not let the offer create a wedge between themselves and Maori seeking the recognition of our rights rather than commercial redress. Even Winston Peters is calling the government’s offer “divide and rule” and pointing out that “it’s designed to try and corrode support for the Maori Council's action”. Wedge politics, essentially. The most important thing is rights recognition. Commercial redress is a secondary concern. That’s why I support the NZMC’s court action. That’s why iwi should. And all praise to the Maori Party for supporting rights recognition before commercial redress. Oh, and iwi who are willing to let the sales proceed would do well to remember that 88% of Maori oppose, key word oppose, asset sales. Only 8% support the sales. Something to keep in mind. In a democratic society, the right to protest is a fundamental freedom. When we restrict or demonise civil resistance, we’re doing our democracy a disservice. 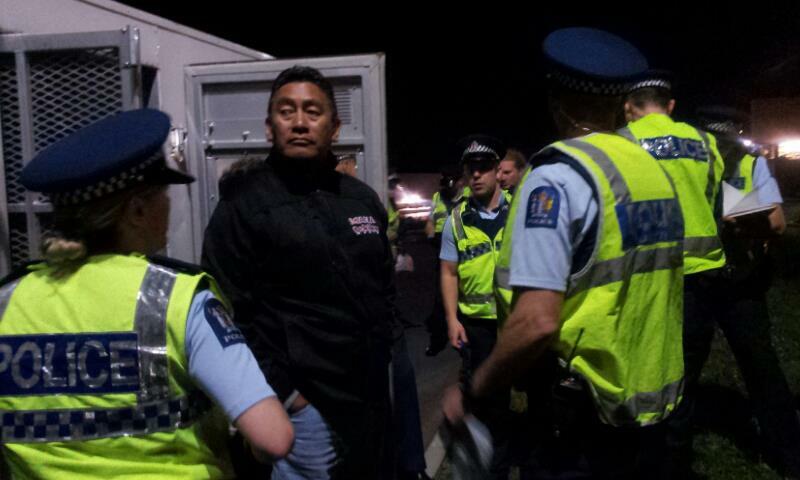 News broke last night that Glen Innes Police moved to arrest Hone Harawira, MP and leader of the Mana Party. A number of other protestors were arrested as well. According to John Minto, the Mana Party spokesperson, Hone parked his car behind a removal truck and refused to move. The Police wanted to tow the car, but they had to remove Hone first. The Police smashed “at least one window” and arrested Hone for “failure to remove a vehicle”. Judging from the reaction from some on the right, you’d have thought Hone rammed a cop. Well, he didn’t. He was exercising his right to protest. A right that we as a society should not demonise or take for granted. The Bill of Rights Act 1990 provides the “freedom of peaceful assembly” and a “freedom of expression”. The right to protests is, in my opinion, a manifestation of the right to peaceful assembly and the right to freedom of expression. Having said that, there is no right to break the law and break the law is what Hone did, apparently. Well, that’s not for you, I or the Police to decide. In any event, Hone clearly lacked criminal intent. And isn't minor and technical law breaking an accepted aspect of civil resistance? From the civil rights movement in the US to Bastion Point in NZ. I didn't go there to get arrested. I went there to show solidarity and support… I went with my wife. To show her the commitment of the families of GI. These are families who have been there since just after the Second World War, and they are being pushed out of their house. (the) NZLP need to find ways to inspire the same public enthusiasm in other areas as we saw for marriage equality. It can be done. Framing matters. Well, it’s hard to disagree with that. However, Craig Ranapia and Giovanni Tiso argued that framing is a secondary concern when the “picture inside is crap” and when “the party has nothing to communicate”. Without wanting to cop out, I agree with both views. Framing is important, but not possible where there is nothing to frame. Having said that, I think we’re missing the point here. Framing does not have to be understood in terms of policy, but on a more basic level. Essentially, Labour has failed to draw a meaningful contrast between themselves and National. National stands for cutting the deficit and, well, so does Labour. Labour wants to target beneficiaries and, well, so does National. National wants to boost employment and, well, so does Labour. David Shearer needs to position Labour against National on the fundamentals. Yes, Labour can stand for cutting the deficit, but that idea needs to be presented from a left wing perspective. For example, Labour will grow our way out of the deficit. Shearer must then juxtapose Labour’s position against National’s ‘let’s cut our way out of the deficit’. An unsophisticated example, I know, but it illustrates the point I’m trying to make. Helen Clark drew an interesting contrast between Labour and National in (I think) the 2005 election when she told Breakfast, and I paraphrase, that the National Party doesn’t stand for anything except power. It was a powerful contrast (ignore the pun). Clark painted National as unprincipled and willing to push divisive policy for the sake of power. On the other hand, Labour was painted as the party of principle - the party of Working for Families and so on. Framing on that fundamental level matters, framing policy comes second. Labour might be running on a different policy platform, but it makes little difference when the party stands, or is seen to stand, for the same goals as National. In August Kelvin Davis wrote that “It's like they're more comfortable being ignored than criticised”. Correct: Labour fears being seen as different on the fundamentals. They don’t want to risk offending the orthodoxy. To use the above example, they fear being seen as opposed to deficit reduction – or the orthodox approach to deficit reduction (i.e. cuts). The party fear being seen as a party for beneficiaries. However, if the leadership had more political nous they would frame themselves as the party for the poor. Instead, in a clumsy attempt to inoculate himself against beneficiary sympathising David Shearer delivered the infamous beneficiary on the roof speech. Unless Labour reframe themselves on the fundamentals, there’s little reason to vote for them. In this respect, Labour can take their lead from John Tamihere. This may seem counterintuitive, but Tamihere has taken a lead role in attacking the government’s “shonky economics”. On Q&A last week Tamihere explicitly rejected neoliberalism. Tamihere contrasted himself against National on a fundamental point – the economy. At the moment Labour looks like the National Cabinet in red ties – I don’t want to vote for that and I suspect most on the left don’t want to vote for that. My exams are creeping up so expect irregular posts from me. However, on the upside, Karla Akuhata from By Microwave and formerly of the Waikato Times will be joining us. I'm stoked to have her on board and look forward to her posts. Labour leader David Shearer is eyeing a possible reshuffle of key portfolios before the end of the year, with his entire front bench subject to scrutiny. Two factors reduce the odds of a significant reshuffle; 1) internal politics and 2) self-preservation. Some portfolios are wedded to their MP, for example Maori Affairs is welded to Parekura Horomia and earthquake recovery is married to Lianne Dalziel, while other MPs retain a right to a ranked position through service (remembering Labour ranks their major MPs from 1 to 20). Nanaia Mahuta may be under threat in the education portfolio, although she has insisted she is not going anywhere and appears to have redoubled her efforts. Despite what others say, I’m not convinced Nanaia is a non-performer. According to DPF’s opposition performance statistics, Nanaia is the 10th most effective Labour MP – ahead of deputy leader Grant Robertson and rumoured replacement Chris Hipkins. However, I readily admit those statistics are quantitative. If I were heading a reshuffle I’d promote Chris Hipkins to the front bench and give Louisa Wall and Andrew Little a top 20 ranking. Moana Mackey and David Clark should also receive more significant portfolios.